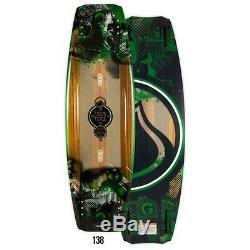 2013 Liquid Force Shane Hybrid Wakeboard. Whether blasting off a huge double-up at BROstock or sliding his way to glory at a cable event, Shane has proven that his board is as versatile as they come. One of the early backers of our Hybrid Technology, Shane has always seen the advantage that this tech provides in multiple scenarios and conditions. The LF exclusive Grind base will protect the board from all the abuse you can give it. The aggressive three-stage rocker provides huge lift while the unique bottom channels provide the speed that Shane has always demanded in his boards. The flex pattern provides anyone the chance to be a rail ruler. Just like Shane, this board is no one trick pony. Hybrid Technology - A well tested performance hull shape and responsive flex construction delivers the board that excels in all terrains. LF Exclusive Grind Base - The ultimate in durability from our sintered base material while maintaining the hull shape. Aggressive, Three-Stage Rocker - For blowing up off the wake to catch-free transitions in the parks, this rocker style works wherever you need it. Double to Triple Concave Hull - Double through center displaces water for softer landings with no speed loss. Triple Concave at ends for ollie power and pop with superior edge hold. LF Exclusive Liquid Rail - Elastomeric sidewall for the ultimate rail bond and unsurpassed durability. SIZE: 138cm (130lbs & up). The item "2013 Liquid Force Shane Hybrid" is in sale since Thursday, May 11, 2017. This item is in the category "Sporting Goods\Water Sports\Wakeboarding & Waterskiing\Wakeboards". The seller is "watersportsmarine" and is located in Fenton, Michigan. This item can be shipped to United States, Canada, United Kingdom, Denmark, Romania, Slovakia, Bulgaria, Czech republic, Finland, Hungary, Latvia, Lithuania, Malta, Estonia, Australia, Greece, Portugal, Cyprus, Slovenia, Japan, China, Sweden, South Korea, Indonesia, Taiwan, South africa, Thailand, Belgium, France, Hong Kong, Ireland, Netherlands, Poland, Spain, Italy, Germany, Austria, Russian federation, Israel, Mexico, New Zealand, Philippines, Singapore, Switzerland, Norway, Saudi arabia, Ukraine, United arab emirates, Qatar, Kuwait, Bahrain, Croatia, Malaysia, Brazil, Chile, Colombia, Costa rica, Panama, Trinidad and tobago, Guatemala, Honduras, Jamaica.